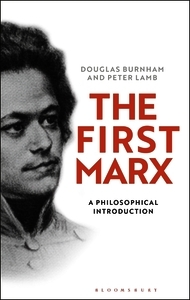 Marx's early work is well known and widely available, but it usually interpreted as at best a kind of stepping-stone to the Marx of Capital. This book offers something completely different; it reconstructs, from his first writings spanning from 1835 to 1846, a coherent and well-rounded political philosophy. The influence of Engels upon the development of that philosophy is discussed. This, it is argued, was a philosophy that Marx could have presented had he put the ideas together, as he hinted was his eventual intention. Had he done so, this first Marx would have made an even greater contribution to social and political philosophy than is generally acknowledged today. Arguments regarding revolutionary change, contradiction and other topics such as production, alienation and emancipation contribute to a powerful analysis in the early works of Marx, one which is worthy of discussion on its own merits. This analysis is distributed among a range of books, papers, letters and other writings, and is gathered here for the first time. Marx's work of the period was driven by his commitment to emancipation. Moreover, as is discussed in the conclusion to this book, his emancipatory philosophy continues to have resonance today. This new book presents Marx in a unique, new light and will be indispensable reading for all studying and following his work.